What's this talk about snow in North Texas this weekend? It's possible! 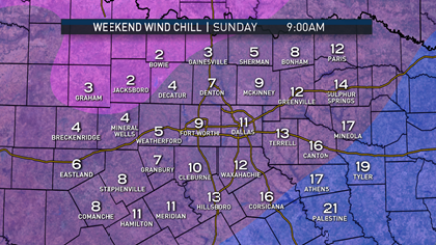 Bitter cold is expected to push into North Texas over the weekend, bringing wind chills near zero degrees on Sunday and a slight chance of snow. The first part of the weekend will actually be quite warm and spring-like Saturday with a high in the 70s around midday. 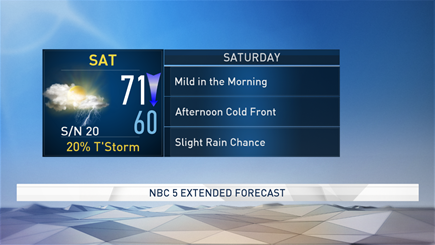 Watch the latest NBC 5 video forecast here. But that won't last too long before things start to get much, much cooler. 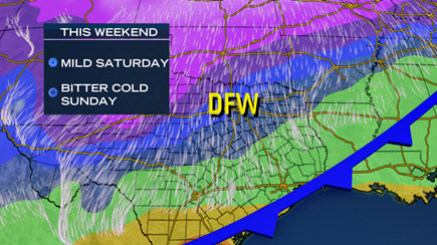 The cold front will arrive in the middle of the afternoon Saturday and temperatures will drop accordingly. There will be a slight chance of thunderstorms ahead of the front, but it looks like the higher chance of storms will be farther east and southeast. At this time, I'll leave a 20 percent chance in for the Metroplex, but I don't think we'll see much. It's likely to be an abrupt drop from the 70s into the 40s by 6 p.m. The Arctic air will build later in the evening. In fact, we should be close to freezing by 9 or 10 p.m. Saturday and begin to see wind chills in the teens toward midnight. It will be cold enough for snow overnight Saturday into Sunday morning, but the question is how much moisture will be available. 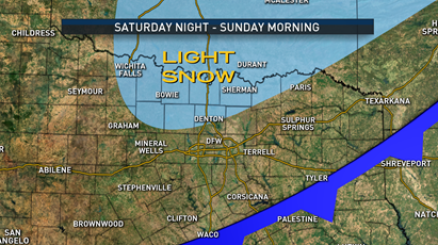 At this time, it looks like there will be enough for at least some light snow, mainly north of DFW. Flurries should be confined to areas along the Red River. If there's any accumulation it's unlikely to be more than a dusting. As always, stay tuned as the weather models may identify more moisture as we get closer to the event. One thing is for sure, (snow or no snow) it's going to be really cold Sunday! 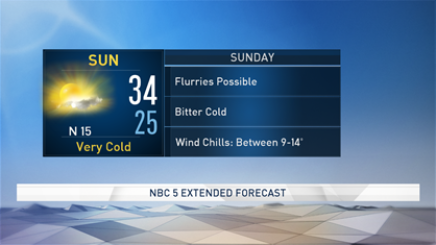 Here's a glance at the wind chill forecast early Sunday. Notice the single digits! Yowzah! Sunday afternoon will be sunny, but very cold. In fact, this batch of Arctic air could be colder than the one we had last week. Now is the time to take all your cold weather precautions. NBC 5 Meteorologist Rick Mitchell takes a look back at the coldest December on record.